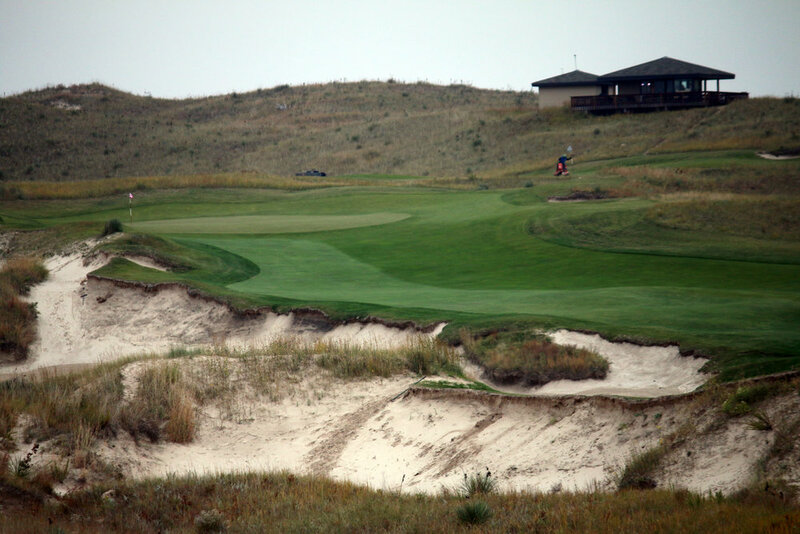 Sand Hills Golf Club is a course that tests a player's appetite for risk on every hole. Usually, the line of charm is guarded by a fierce hazard. It's final examination comes in dramatic fashion with the memorable long par 4 18th. From the tee: Two 30' fairway bunkers rest on the left side of the hole and carry an intimidating presence. The fairway spans nearly 70 yards and gives players plenty of space but forces a decision, left or right. The heroic play up the left side yields a shorter approach with a better angle to the green. The safe play is up the right side but leads to a longer approach shot to a green that runs away from players. Miss a little too far right and a bunker or native grasses add another level of difficulty for timid play. Approaching the green: Elevated high and above the fairway it's semi-blind nature brings added challenge. The green orients and rewards approach shots from the left side of the fairway. It also slopes from right to left, adding more reward for finding the left side. For every yard off the aggressive left line a player goes, the more difficult their approach shot becomes. What makes the 18th at Sand Hills a standout hole is the tremendous scale of its fairway bunkers. Most bunkers provide an opportunity for recovery, but not these, they will exact at least a one-shot penalty to any player who finds them. The intimidation from these traps leads to players aiming right, whether they know it or not. This is a hole design that Coore and Crenshaw used at other site. A few of note include the 15th at Streamsong's Red Course and the 13th at Trinity Forest.